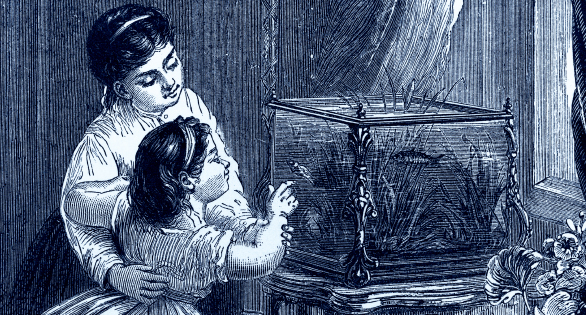 Victorian aquarium, approximately 20 gallons or 76 liters. 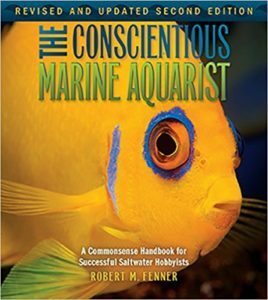 From The Conscientious Marine Aquarist by Robert M. Fenner © Microcosm Ltd.
A handy set of quick aquarium size references, volumetric conversions, and tools is available following the article. How small is small? What volume of seawater is large and stable enough to suit you and some modicum of livestock, but not so tiny as to crash with any electrical outage, unnoticed death of a specimen, or hint of overfeeding? Think about this. To Shamu, an Olympic pool is teeny; to me, a small marine tank is 40 gallons. Anything smaller is too limiting in what you can practically keep in it, and too unstable in my opinion. Yet I’ve seen successful 2-, 5-, and 10-gallon setups. The inhabitants may have been only a Condylactis anemone, a shrimp, and a damsel, but they were alive; the question is how well did they do, and for how long did they linger? Whether it’s done to show off, experiment, have a portable system, or for lack of funds or space, micro saltwater systems of all types are possible. They are just not especially stable or, for the most part, practical. Aquariums with severely limited volumes even for experts are dangerously erratic in their temperature and many measures of water chemistry. Beginners with pico systems often do not have the reefkeeping skills or self-discipline to succeed. There are advantages to larger systems, such as dilution of wastes, homeostasis of water chemistry and physical makeup, and psychological space for behavioral expression or retreat by the animals. Metabolism is a key element in small-volume setups. Corals, small invertebrates, and some macroalgae species can thrive in micro reef setups. Fishes can pose problems: Animals with behavior and physiologies more akin to turtles versus hummingbirds are preferred. Consider the smaller hawkfishes and clownfishes, gobies, blennies, small basslets, and less boisterous families, instead of the big, active fish groups like triggers, angels, tangs, and butterflies. Space compatibility refers to the minimum physiological and psychological elbowroom requirements of and between species. Stinging-celled animals (such as corals and anemones), sponges, and echinoderms and others pose possible difficulties when crowded to the point of touching. Some exude toxins to protect their territories; others even extend lethal sweeper tentacles, often at night, to sting any sessile invertebrates within reach. These species survival mechanisms ensure light, space, and food for competing individuals in the wild and they can mean real trouble in the small confines of our aquariums. 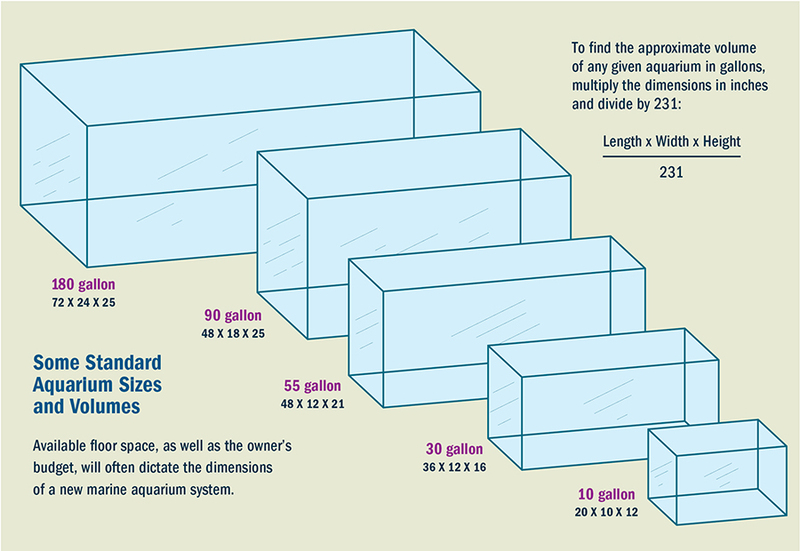 Relative aquarium sizes in US Gallons. Click to enlarge. 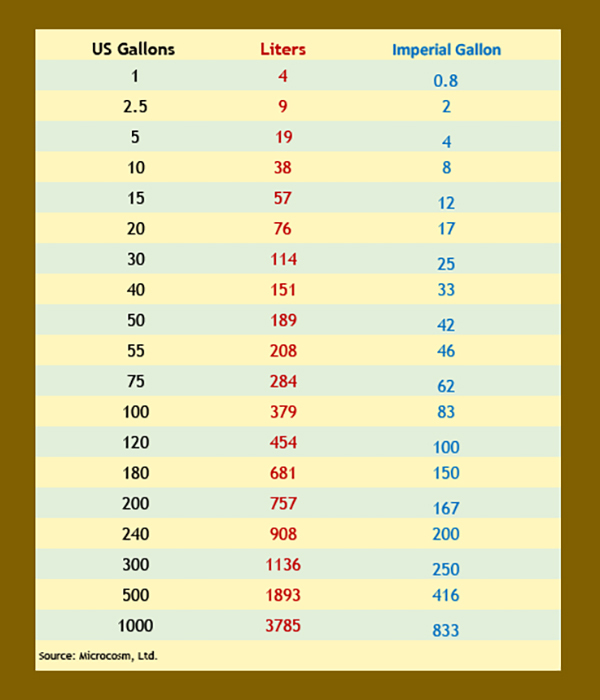 Volume Conversion Chart; easily convert common aquarium sizes from US Gallons to Liters or Imperial Gallons.